You have changed your job. You had a PF account and UAN with the earlier employer. Now the new Organisation has also made a PF account for you. 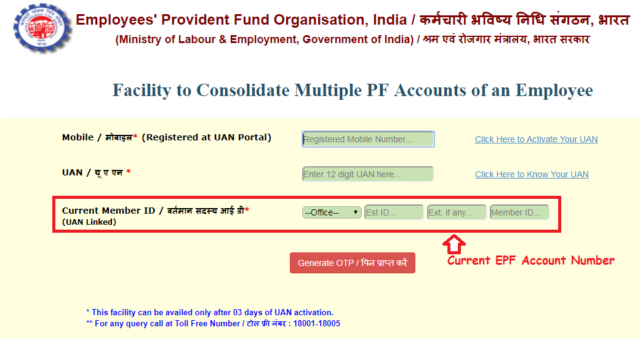 How to link new EPF account to existing UAN so that all your PF account comes with a single UAN? 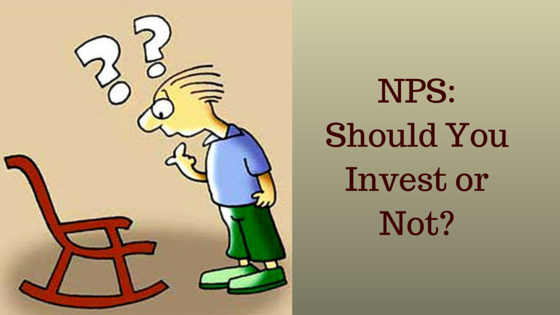 Introduction of the UAN is a very important step forward taken by EPFO. It will obviously do all the process related to EPF faster and smooth. With the UAN you can also withdraw your PF directly without the help of past employer. Universal Account Number (UAN) is a unique number related to every EPF subscriber. People are changing jobs and they have multiple PF accounts. EPFO has introduced UAN to solve the issue of multiple PF accounts and all other EPFO services such as transfer and claim from one to another PF account. If you have not activated your UAN till now with the existing PF account, collect it from your employer, link existing PF account to UAN and activate the UAN fast. I suggest you read another article ‘PF Made Easy- All about EPF UAN or Universal Account Number’ where you will find the importance of UAN, How to generate UAN and How to activate UAN number. With the UAN you can also know the PF balance online and download the UAN passbook. How to combine multiple PF accounts online? You have changed your job many times and every time your employer has opened a PF account for you. You are struggling to combine those accounts or transfer to one account. The new EPFO facility of providing UAN has made your job easy with respect to handling multiple PF accounts. You can combine the multiple PF accounts online in the following steps. Go to Our Services>For Employees and click on ‘One employee- One EPF account’. Put your registered mobile number which is already linked with UAN, the UAN and current EPF account number which is linked with the UAN. Click on generate OTP and after successful verification of OTP you will be redirected to another page to put your past EPF account numbers. After entering all EPF account numbers, submit it. Remember, you can add up to 10 EPF accounts with the UAN. These details will be sent to respective regional EPFO offices. They will verify the information with the employers. After the verification the all the accounts will be combined and comes under single UAN. After the process is completed, you will get SMS notification to your registered mobile number. Remember to correct all the details such as name, Date of birth etc. match the EPFO database and UAN number. 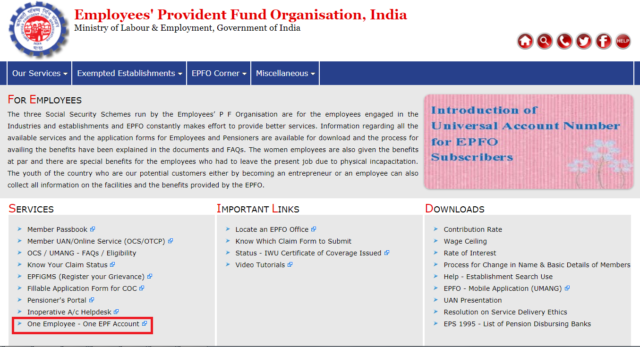 How to link new EPF account to existing UAN? The above process is applicable when you have existing EPF account linked with UAN and you want to add your past EPF accounts. Suppose, you are changing a job and UAN is already allotted and activated with your past employer. You need to provide the UAN to the new employer. The new employer will link the new EPF member ID with the existing UAN. This can be done by filling up a new form 11 which replaces the old form 11 & form 13. This is a simplified form of earlier form 11. It is required to be filled when you are getting employed with a new employer. With this form, you are also requesting to transfer the funds from old EPF accounts with the help UAN facility. So, if you have already the UAN number and KYC is verified you just submit the new form 11 to the new employer and your new EPF account is linked with the UAN number. How can you merge two UAN numbers? When you have overlooked to inform the new employer about your existing UAN number the new employer generates an EPF account number along with UAN, you have two UAN numbers. If the employee leaves the organization without any notice or proper exit procedure the employer will not update the exit fate from the organization. Hence, the new employer will generate a new UAN automatically. There are many cases where one employee have two or multiple UAN numbers and they need to be merged in single UAN number. You can follow the following two ways by which you can merge the multiple UAN numbers. This is the simplest process to merge multiple UAN numbers. When you observe or detect the multiple UAN numbers, immediately you write an email to uanepf@epfindia.gov.in by stating the UAN numbers and employment history. After verifying with the employers EPFO will close the old UAN and current UAN will be continued. 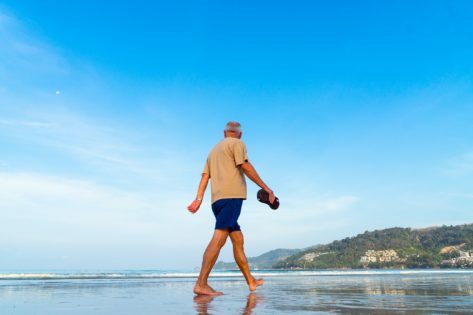 After that, you need to transfer the money from old account to new and active UAN number. You can transfer the money of old EPF account to the new EPF account with the help of Online Transfer Claim Portal or EPFO. The EPFO system will identify the cases where members requested to transfer their PF from one account to another account. EPFO will check periodically where the EPF balances are transferred and the UAN numbers which are linked to the EPF accounts. After the identification of all such UANs where from PF money has been already transferred will be blocked and deactivated from further use. After the deactivation of old UAN, the earlier EPF account number which was linked with old UAN will be now linked with recent UAN. You will get an SMS notification when your old UAN gets deactivated. You need to activate the new UAN if you have not yet activated the new UAN. The UAN solves your all queries related to EPF very easily. You need to activate the UAN number with the EPFO. Please remember your KYC to be updated for any service related to EPFO and UAN. When you are joining to a new job don’t forget to inform the earlier UAN number to your employer. You can follow Investdunia Facebook Page and Twitter for regular updates.